In order to raise money for the community garden, I'm wanting to have a plant sale. To have plants ready for a late-May plant sale without taking over my dining room table with puny little seedlings, heat mats and grown lights, I plan to winter-sow them. Winter Sowing is a special technique to grow 'hardened' seedlings. It means I can plant my seeds and keep them outside (freeing up my dining room) and once they sprout, they will be in it's sheltered little "greenhouse" (a milk jug) which will supply sunlight and efficient moisture (if there is no snow or rain then some watering may be required). When it is time to transplant, the seedlings will usually be bigger and stronger than indoor grown seedlings, and they will already be hardened off and ready to plant. Last year was the first time I had tried winter-sowing and was I was pleased with how they turned out. It really seemed to extend the growing season for me and gave me much hardier plants to work with! I had already been saving up milk jugs and had 13 of them by mid January, but with the new plan to have a plant sale, I knew I was going to need a LOT more milk jugs. A request was sent out in my neighborhood (through NextDoor) for milk jugs and/or 2-liter bottles for winter-sowing and let me tell you...my neighbors really through! This is just half of the milk jugs I received! And I still have more to pick up! The original plan was to start winter sowing in late March (since last year I didn't get sprouts until mid April anyway) but I wound up with so many milk jugs to plant that I figured I'd better start as soon as possible and just do a little at a time until they're done. It really helps to get the jugs prepared ahead of time. 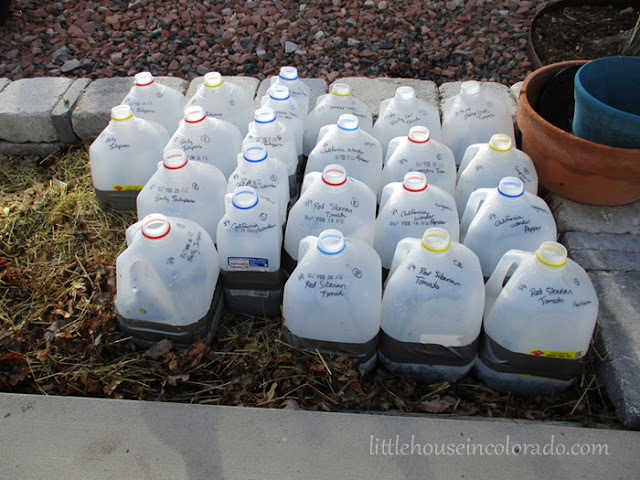 I prepped a bunch of milk jugs in early February (when a bunch of these pictures were taken) and kept them stored in giant bags until I was ready to plant. When a pretty day in early march arrived, I was ready to tackle the planting. To start, remove the lids. 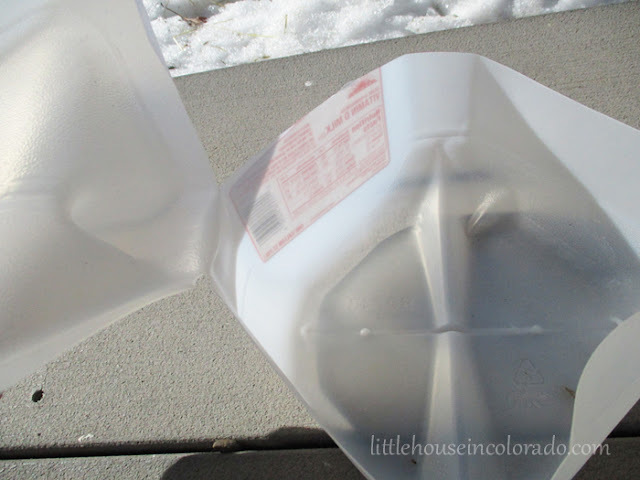 You can toss or recycle the lids. You won't be needing them. 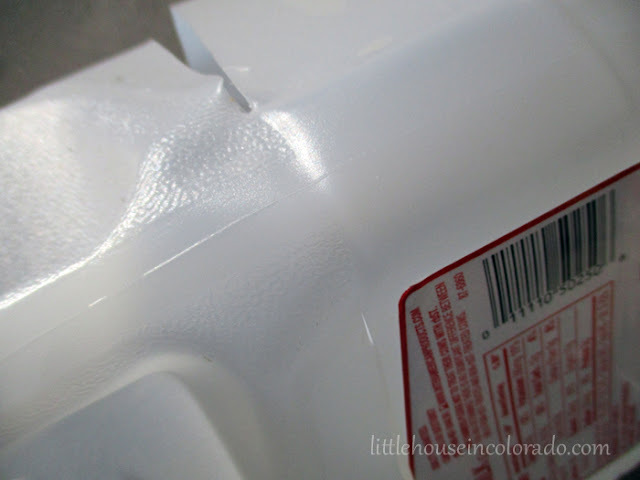 Then cut around the milk jug, leaving a space below the handle to act as a "hinge." 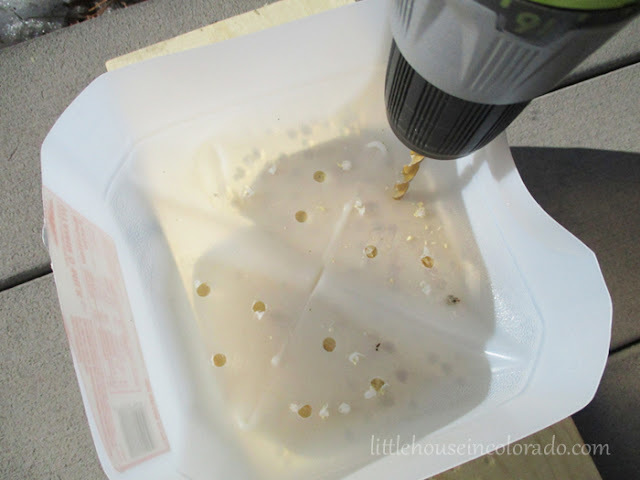 Next, poke or drill drainage holes into the base. 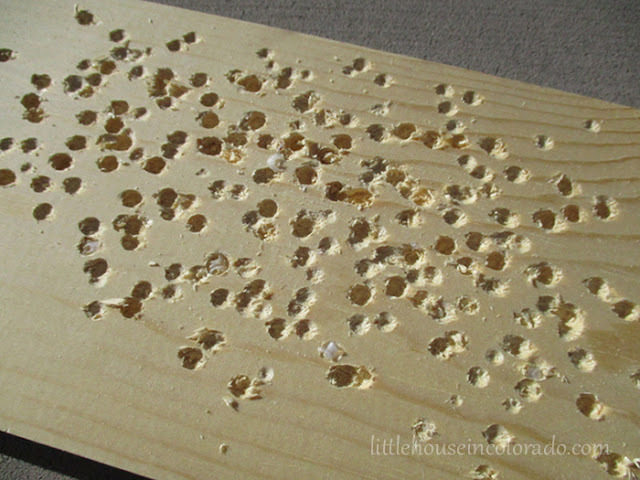 I use the same drill and 1/4" drill bit for these holes. It makes this part of the preparation go very quickly. 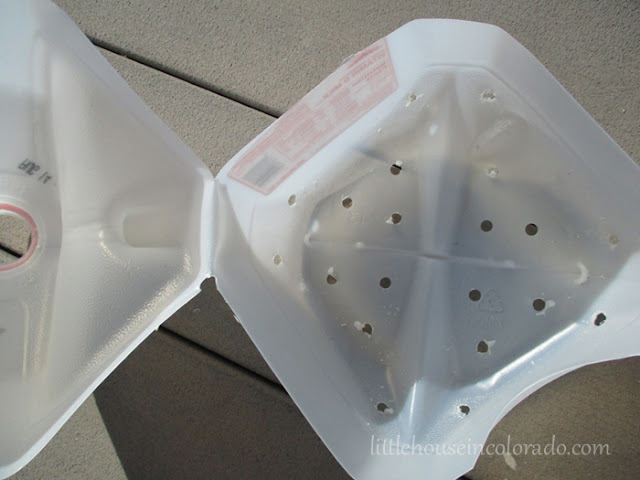 You want make sure you have enough holes so your seedlings don't get too wet and rot in the soil. 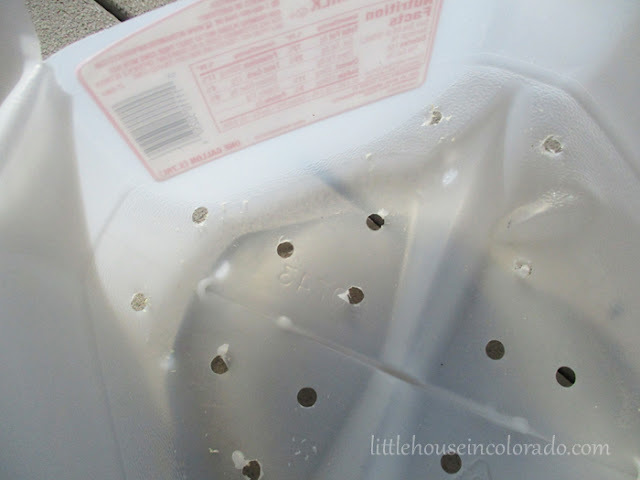 For a gallon container, I aim for at least 12 holes - 3 in each quarter section. I also put a couple holes in each corner about 1" up from the base. You can plant your milk jugs anytime. It doesn't matter if you have three feet of snow on the ground. This is really nice if you're itching to plant something in the middle of winter. I chose a relatively sunny day to plant since I would be working outside. The sun just made it more pleasant. 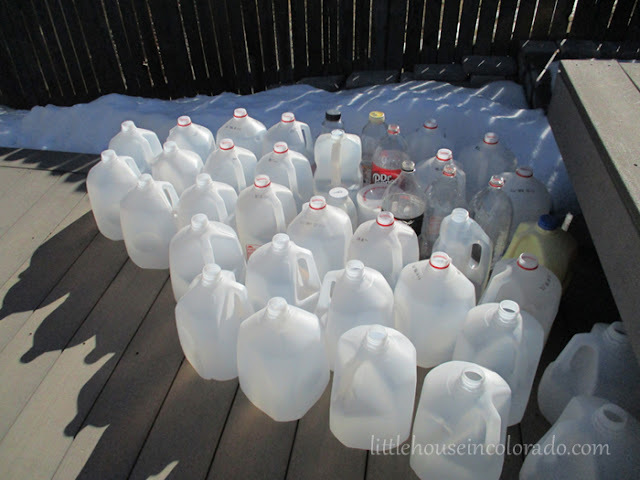 You could do the work in your basement or garage in the middle of a blizzard if you like and set the jugs outside when you're done. First, fill the base of your jugs with soil. You want good quality soil here but try to avoid potting soil with fertilizers. Happy Frog is a great soil that is often recommended by winter-sowers. Last year, I used "Roots Organics Greenfields Potting Soil" and it seemed to do just fine. 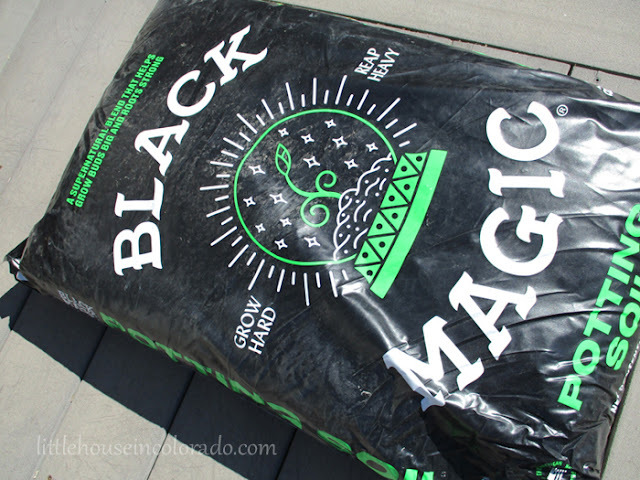 This year, I'm trying "Black Magic" potting soil that was on sale at Home Depot. Water the soil. Make sure to water it well and make sure the excess drains out the bottom. I do this before putting the seeds in so I can make sure the soil is watered well without having to worry about the seeds being disturbed by the water flow. Plant your seeds. 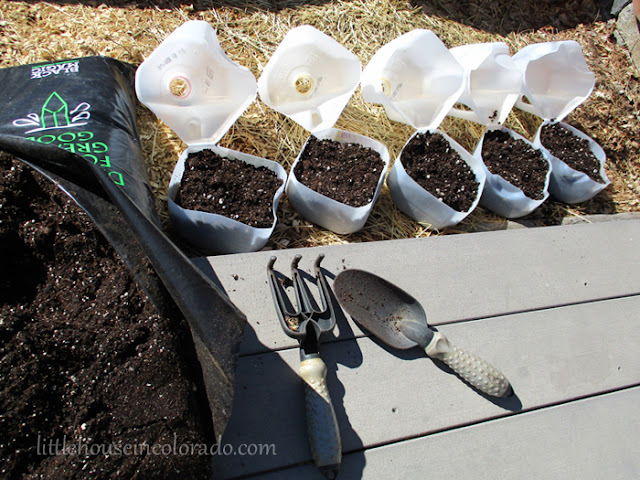 You can certainly plant more than one or two, especially if you are planting in a gallon jug. Last year I poked 3 holes in the soil and planted 2 seeds per hole. This year, I'll be transplanting a lot of them to individual containers with 2 seedlings each so I planted 8 seeds in each gallon jug (4 holes with 2 seeds per hole). I'm hoping that's not too many. We'll see what happens. It's all a learning process and they'll only have a couple months to germinate and grow before they are separated. Label your plants. I put a label on the inside AND write the name on the jug. 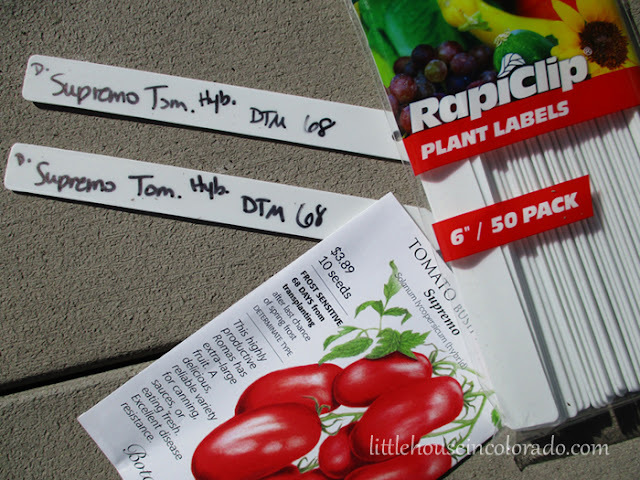 I use these Rapiclip 6" Plant Labels on the inside. 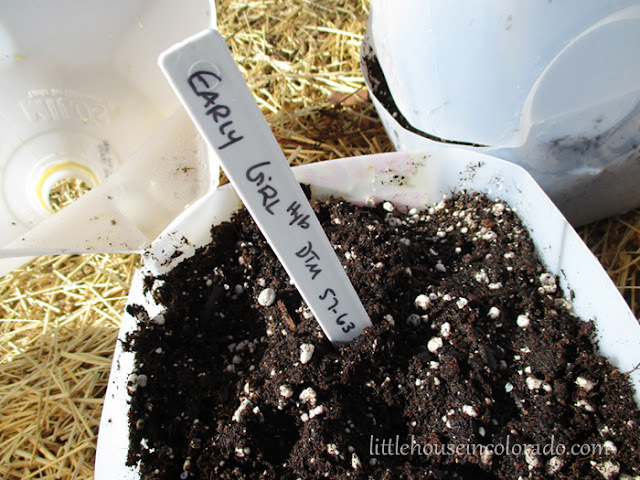 They can be reused again and again year after year assuming you are planting the same thing. Many winter-sowers have said to use paint pens on the outsides of the jugs because Sharpies don't stay on very well. I used a Sharpie last year and the writing didn't even fade. Perhaps moisture plays a big roll in the "wearability" of the ink. There isn't a whole lot of humidity in Colorado and the snow hasn't affected the ink at all. I also keep the side of the jug with writing facing east so the ink doesn't fade (our afternoon sun from the west is really intense). Tape the lid in place. Plain grey duct tape will work well for this. Don't use packing tape, masking tape, electrical tape, scotch tape, etc. They won't work. Just use strong, plain duct tape. 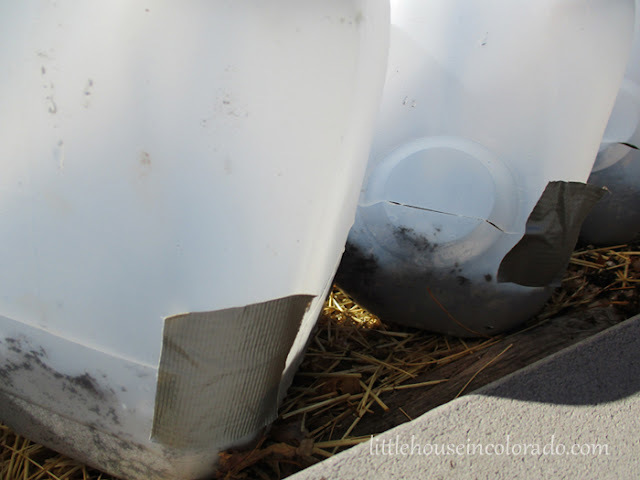 Some people find it helpful to use small duct tape pieces to first hold the top in place and then use longer pieces to completely go around the jug (you'll see the jugs in the last photo have the tape all the way around the seam). Make SURE the seam is sealed. 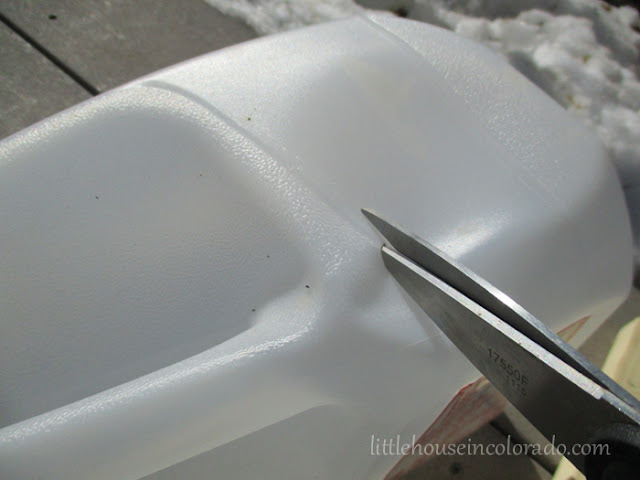 The tighter the seal, the more your jug can become a "mini greenhouse." Pack the jugs together right up next to each other so they can provide stability and protection for each other. Be sure the lids are removed so water and air can get in. Now you wait. Patience is key here...especially if you plant really early. The seeds will sprout when conditions are right. My seeds didn't sprout until mid-April last year. You don't have to check them every day. They will be fine. HOWEVER...you do need to be sure the soil is moist (if there has been no precipitation, you may need to water them). Also, if you have a long warm spell and the seeds sprout too early, you will want to take precautions so they don't freeze if the temperature drops again. Give them extra insulation. Move the to the middle of the group. Cover them with blankets. Do what you can to get them through the freeze. The first day of winter sowing this year and I finished 23 jugs. Woo Hoo! Want to watch some videos about winter-sowing and learn how to do it in your own garden? Here is a playlist on YouTube that is FULL of great winter-sowing information!